The deputy Senate president, Ike Ekweremadu, and the Senate leader, Ahmad Lawan, have disagreed over the political party that has the highest number of senators. Mr Lawan on Thursday raised a point of order, calling the attention of his colleagues to a media report which, according to him, was erroneous and misquoted the number of lawmakers in the senate. 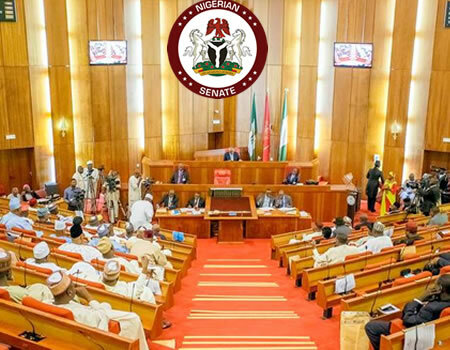 He said the report stated that senators of the Peoples Democratic Party (PDP) were higher in number than those of the All Progressives Congress (APC). In recent months, a number of defections have been recorded in the upper legislative chamber, especially between the APC and PDP. “Daily Trust reported on page 57 that the APC senators are 57 and the PDP senators are 58. For the record, APC senators are 56 while PDP senators are 46,” he said. Mr Lawan also faulted the newspaper’s report on Festus Keyamo’s confirmation as member of the board of the Nigerian Deposit Insurance Corporation on Wednesday. “On page 7, it reported that when the question was put during the confirmation of Festus Keyamo as member of the board of NDIC, the ‘nays’ had it but that you said the ‘ayes’ had it. “For the record, the first time you put the question, there was no clear winner so you put the second question and your judgement was right, the ayes had it. “I needed to put this record straight so that nobody in the future is misguided on what happened,” he said. In his response, Mr Ekweremadu, who presided, told Mr Lawan that his figures were wrong. “On the issue of the number I don’t think there’s any particular statistics in respect of how many members you have in any particular party. There’s no such statistics for now,” he said. Reacting to the voice vote, he explained that the manner of voting during plenary is determined by the voice vote and the perception of the presiding officer. “If you have any issue with the way the presiding officer has ruled, you can raise objection. “But since nobody asked for division, I believe that the entire Senate accepted the ruling so, I’m surprised that somebody is making an issue out of it,” he said. While urging the media to be responsible and respect the way the Senate’s business is conducted, he said only members of the Senate are permitted to complain in such circumstances.